Bula vinaka to you all. I just remembered that last year (2013) there was a query about how to best engage youths in agriculture, such as by using social media and other ICTs. I had the opportunity to share my experiences and stories. Please have a read. 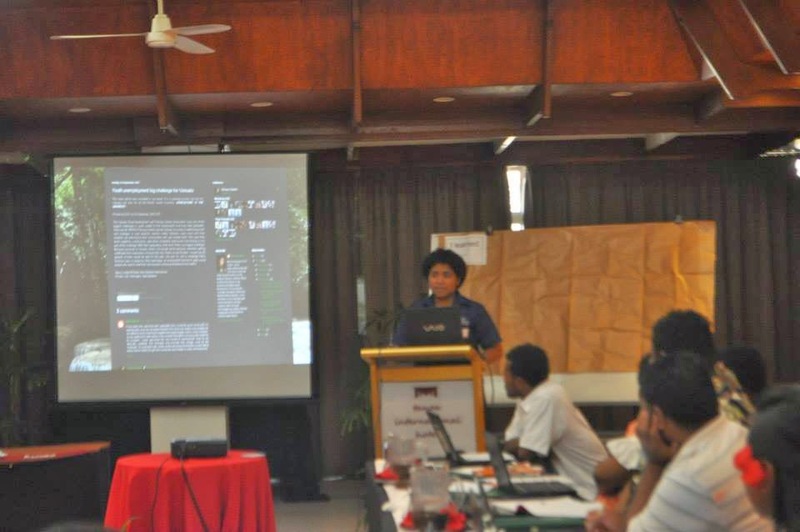 Presenting my blog at the Pacific Web 2.0 training in Nadi. I'am a young person who is passionate about agriculture, but unfortunately I'am not in the majority and so I spend my free time with my family and my church youth group, encouraging them to take an interest in agriculture. I also enjoy being involved in my family's farm, and last year we've started planting more vegetables, like cabbages, tomatoes, lettuce and pumpkins etc. With my church youth group we have days set aside to discuss projects; at the moment our youths have started off with farming of vegetables and crops and I'am also looking at introducing a piggery farm with the youth. I'am also the Animal Health Intern at SPC-LRD, Animal Health and Production Team, and that really helps me to share my knowledge with my families, friends and youth group. What I learn from my internship I try and apply to the church youth, community, my families and our backyard garden. Also I get advice from our experts and officers here especially on the livestock side. I think it's good to get youths involved in agriculture as they are young, active and strong hence they get more work done faster, i.e. either crop farming or rearing of livestock's for household or commercial use. Agriculture is something to keep unemployed youths grounded at home and keep them out of mischief but at the same time they learn and earn from it. Farming is one profession that is a major source of income today and not many youths realize that. Unfortunately most youths look at agriculture as a dirty and "last resort" profession, I guess it's the mentality of people and that's why agriculture is being looked at this way - people's mentality of being successful is to be a lawyer, doctor, nurse etc. At the church our youths ranges from 19 to 28. Some of their families have farms, but usually away in their family village and not in their backyard; it might be someone else doing the farming and not them hence getting them out there together and involved in agriculture with everyone is a good motivation for them. For the youths, it's something that brings us together and it encourages them to learn about farming and its importance. We live in urban areas, it is convenient and easy for us as we're close to the markets and shops – so many ask "why should we bother growing vegetables and crops if we can just get it from the markets/shops"? Through growing and harvesting of crops with the youth group they are starting to appreciate the benefits of farming. Most youths are moving out of the rural areas into urban, leaving older people and young children behind who are not able to work and do not have the energy to plant or farm more, maybe if we could get some sort of source of production and incentive on agricultural attraction i.e. money wise set up in the rural areas for agriculture farming then we will be able to keep the youths there and encourage them to farm more. The opportunity to make money through agriculture is how our farming program initially began. We usually have rallies and sometimes we host them and as hosts we need to have enough funds to pay for the rally event. It started off with a chat with a friend of mine about how we can use farming as a way of earning some money for our youth group and to use them for other church events. While we were chatting we came up with some ideas on how to fundraise, and she said "why don't you bring in your agriculture skills and things you have learned in uni (and at SPC) and we can all pitch in". This became one way to raise money and also educate our youths on farming. Our youths started off with planting of crops and vegetables. Tools and planting materials (such as cassava stems from our own family backyard gardens) were readily provided for so we did not need funds for this. Planting of cassavas were done on backyards of whichever youths that volunteered to give their land for farming. We talked about; when to harvest and who to sell it too and thought it would be better to sell them to our neighbors and church members. It is interesting to see how the youths get interested in details of farming such as harvesting periods, the potential pest and diseases that can affect the crops etc. It is also rewarding to see youths practicing this at their homes hence saving money from buying in markets. I also get asked a lot of questions, especially about pests and diseases that impact the crops and vegetable, and when we can plant taro? - so that will be another step. It's great that we also get support from our families and communities. We've also got a new piggery farm idea and we have discussed this with our cell group to get our youths involved in it. A while ago a youth member of our community mentioned that they have a piggery farm in the village and asked for details in maintaining the farm. The pigs gave birth to 5 healthy piglets. Through the knowledge and information, I received from co-workers in AH&P, LRD, I was able to provide advice to the community and the particular youth on their enquiries on how to maintain the piglets. The piggery idea came up again when we had a meeting with an NGO as they were setting up a pig farm in one of the schools in the outer islands. Also a friend asked me to help with setting up he's new piggery farm. I helped them organize the piggery and I thought "why not just do these for the community as well?" Hence, we have discussed this with our cell group and they think it is a great idea, so at the moment I'm writing a project proposal on the pig farm. Agriculture is like a farming cycle. We can plant crops and vegetables; it would not only feed us as individuals but our animals as well. We can also benefit from animal waste by setting up a Biogas Digester. The effluent (pig waste) can be used as fertilizers to crops and vegetables and production of green energy i.e. electricity and heat to a community. This reduces the cost of buying chemical/artificial fertilizers to keep the soil fertile but is also environmentally friendly. I have a Blog and a shared FB (Facebook) account that promotes agriculture. ICT (Information Communication Technology) is a great way to attract the attention and get the message across to our youths on the importance of Agriculture. We try to promote agriculture in the form of social media as many youths are on FB (Facebook), Twitter, G+ (Google+) etc. The FB account is called "Youth and Agriculture – Sustainability & Modernization through ICT" (login to Facebook, then search: http://www.facebook.com/#!/agrifiji?fref=ts ). This is a shared account with Riten Gosaic. This page is for the people, especially the youths of the Pacific who are involved in agriculture or are thinking of making it a profession. The major objective of this page is to eradicate the stereotype (preconceived negative attitude) that agriculture is for the rural populace and a layman's subject. This page also aims to encourage the youth in saying 'yes' to agriculture. Remember, we in the pacific survive through agriculture. It is the Pacific mainstay and we need to prioritize it. Everyone is invited to share their ideas on ACP agriculture & improvements! For my blog "Finding ME in the Agriculture world" (basically to find myself as a youth in the agriculture sector) – The blog is about myself, you may be wondering why it is about me, I'am an agri. graduate and as a youth I feel that after graduating we find ourselves drifting from one point to another. We do not know which field we want to be involved in or some of us do not get into the field that we really want to be involved in and this blog is also to help other youths who feel the same to basically find our footings and adapting to it. At the same time I post up scholarship opportunities for agri. farming and some of the workshops that I attended etc. A particular social media success has been on my Blog, the piece about "Biogas Digester Effluent Trial" at Koronivia Research Station (KRS) and a comment also from a youth was later posted asking which effluent was used in particular. I was able to personally discuss my experience with the youth. It is a great feeling to know that youths are also reading your posts and sometimes we both learn from each other by information‟s exchanged. This interest in biogas also feeds my interest in the piggery. What can be done to improve services of projects to youths? It‟s this follow-up that‟s so important. For example, SPC LRD in collaboration with CTA organized the web 2.0 training in Fiji and I invited youths from my community as the training would help them. It was great and we all learnt a lot, especially about how to get information using the internet, information about agriculture. Also, these youths knew about FB, but didn't really know about Twitter and Blogs and how to best search for information using Google. Blogs were quite new to them so I showed them about blogs and how other youths are able to read them and get involved in discussions. They really enjoyed using those social media tools and were keen to present what they learnt to their supervisors after the workshop but they had trouble and sometimes found it hard to figure out some details, like for GIS mapping and blogging – for that I took a bit of time to show them afterwards. It's the continuous support that is important, and I think that's difficult to provide as we have limited resource in the Pacific and we can't give every youth one-on-one attention on an ongoing basis. It's the same for all projects, whether for social media education or planting crops or rearing livestock, we should follow up with that, as if we leave it, the youth will typically lose interest – it's just how it is - so we need to take them through to the very end. In conclusion, it is important that we encourage youths to participate in agriculture and not have this profession looked down at. Most youths do not realize that no matter what, ultimately our "survival originates from the soil!" Please note that if you are keen in reading other stories, please do not hesitate to click on this link provided: http://www.spc.int/lrd/index.php?option=com_content&view=article&id=678&Itemid=396- and download the "Consolidated response from Youths in Agriculture attachement at the bottom of the page. Thank you so much for your comment. Glad it was helpful. Thank you for having the time to read my post. I appreciate your kind feedback. Thank you for your time to read my posts. Glad it was helpful. I hope you will enjoy the many more posts that are yet to come. it teaches us something new about. I will be sure to bookmark it. Great post. This article is very interesting .its must be helpful and informative for us. Thanks for sharing your nice post. avis unilendun site agréable à utiliser.